Samenvatting MBEO Summary last press (7th) for MBEO. The chapters are summarized in accordance with the syllabus (subheadings that are not for the exam are not included). Learning this summary is NOT a guarantee of passing the exam, as the slides, lecture notes and other papers are also important. BRT: Additional information (book/articles) that is not in slides This summary contains all extra information (book and articles) that you need in addition to the slides for the exam BRT! 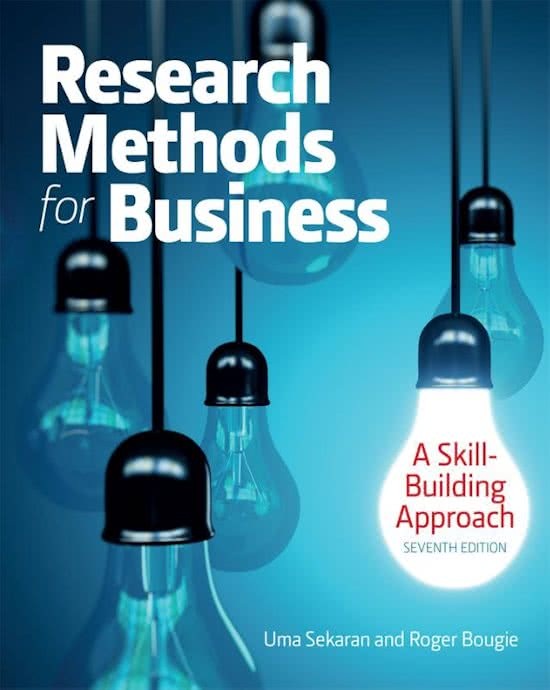 Samenvatting Research Methods for Business: A Skill-Building Approach 7th edition Uitgebreide samenvatting van het boek 'Research Methods for Business: A Skill-Building Approach' van Uma Sekaran & Roger J. Bougie 7e editie. Het betreft de hoofdstukken 1, 2, 3, 5, 7 & 8. Ik heb het vak zelf met een 9.5 afgesloten. BRT ALLE HC uitgebreid uitgewerkt Extended summary / class notes of business research techniques (BRT). All lectures are included with all the slides and many examples. This summary contains all the information you need for the final. Overview BRT Overview of many important aspects of the course Business Research Techniques, concise to be able to quickly read through the material. Good luck! Business research 3 (research methods for business summary) FINAL EXAM Summary of the book: A skill building approach. Uma Sekaran and Roger Bougie. Chapters 5,6,7,8 & 16 (everything which is needed for the final exam) Summary Business research 3 test. IBMS year 2.
Business research 1 (summary for the exam) Book - Research Methods for Business, Uma Sekaran, Roger J. Bougie. Contains summary of all the chapters needed for the exam, according to module guide. Detailed description of the terms with definitions. Complete samenvatting alles hoorcollegeslides Business Research Techniques Complete summary of all the lectures given by the Business Research Techniques box by Elke Schrover. Includes all lectures required for the exam! Year 1, Netflix assignment (attractiveness of the Indian market) This is the best business research report you will ever come across full of references. Coming from the best student in the class. Voorbeeld vragen tentamen Methods of Research and Intervention Voorbeeld vragen tentamen Methods of Research and Intervention. On this page you find summaries, notes, study guides and many more for the study book Research Methods for Business, written by Uma Sekaran & Roger J. Bougie. The summaries are written by students themselves, which gives you the best possible insight into what is important to study about this book. Subjects like BRT, Business Research Techniques, Tilburg University, tilburg university, Premaster, business research techniques, summary & BR3 will be dealt with.